Ngane Ziyamfisa and Khamba Lomovaleliso have been recording with Gallo GRC since 1982. 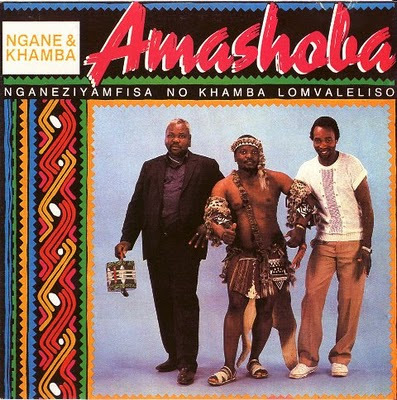 Their albums have all sold consistently well from that date, with the biggest sellers being “Yiyolethombi”, “Laduma” and “Amathambo enKomo Yami”. 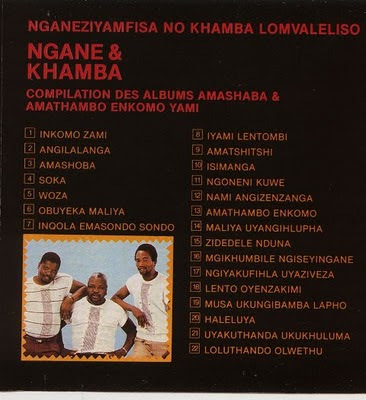 Richard Siluma has produced all the Ngane and Khamba, however this is the first album that he not only produced, engineered and arranged but also sang backing vocals with the group. Ngane and Khamba has always performed typical traditional Zulu songs, which are now currently gaining international recognition. (From the liner notes). “ amaShoba” are cow tails worn on the upper arms and below the knees of Zulu warriors. Thanks to Martin in the Netherlands for sharing these tracks. Thanks for the heads up. There does appear to be a problem with Mediafire - we are working on this and will ipdate immediately we get it fixed.